This is a pub with gastronomy, scrubbed wooden floors and tables and chairs to match its dark interior. The restaurant is at the back and if you can book before 8.00pm then you are guaranteed the table for a number of hours. They do not take bookings on Friday, Saturday or Sunday, when it is first come first served and it does get packed as it did on the Wednesday evening of our visit. The menu consists of “snacks”, starters, main courses with extra veg and dessert and there are enough options to merit a visit by a large party if you want to try, or at least see, most dishes. We couldn’t resist ordering a couple of the pork fat with scotch bonnet on toast. This was at least 4 largish pieces to be shared amongst the four guests. It wasn’t as greasy or as hot as I had feared and would have been great as a snack with a beer. 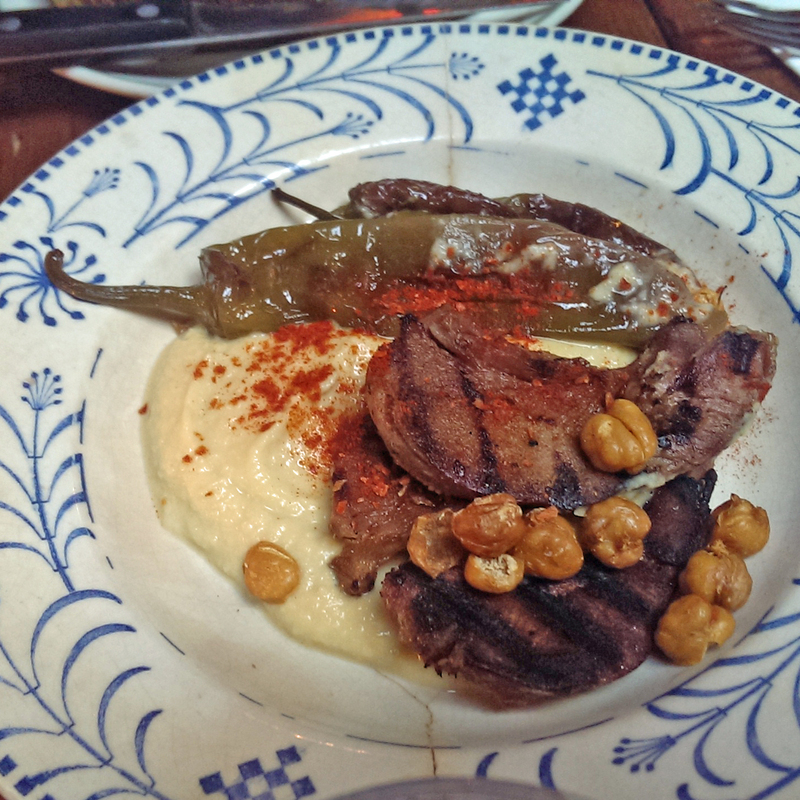 We then decided to be sensation seekers and chose the fried lamb’s tongue and hummus with some chickpeas and pepper too (yes it is not the lettuce it was fried lamb’s tongue) and this turned out to be delicious. The meat was succulent and I would order it again. 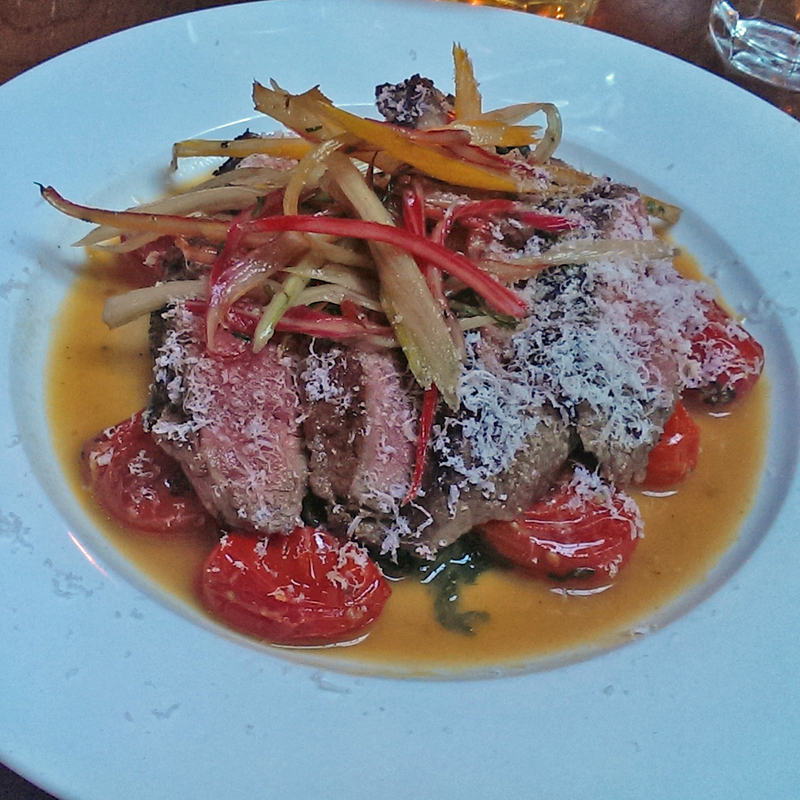 We then chose mostly meat – Slow cooked Featherblade served on sautéed Chard, rainbow chard stems, roasted tomatoes and parmesan (although one of us refused the parmesan). 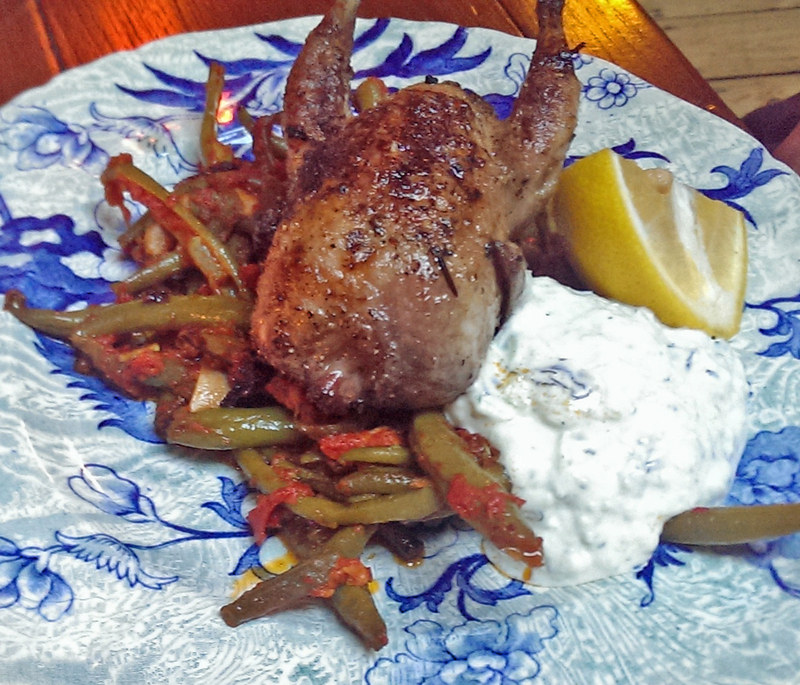 The other two ordered Quail with Turkish style beans and tzatsiki and Masala monkfish, chickpeas, courgettes, almonds and yoghurt. All were hearty sizes and a couple of us failed to finish. The two Italian guests agreed that parmesan definitely wasn’t needed on the Featherblade. 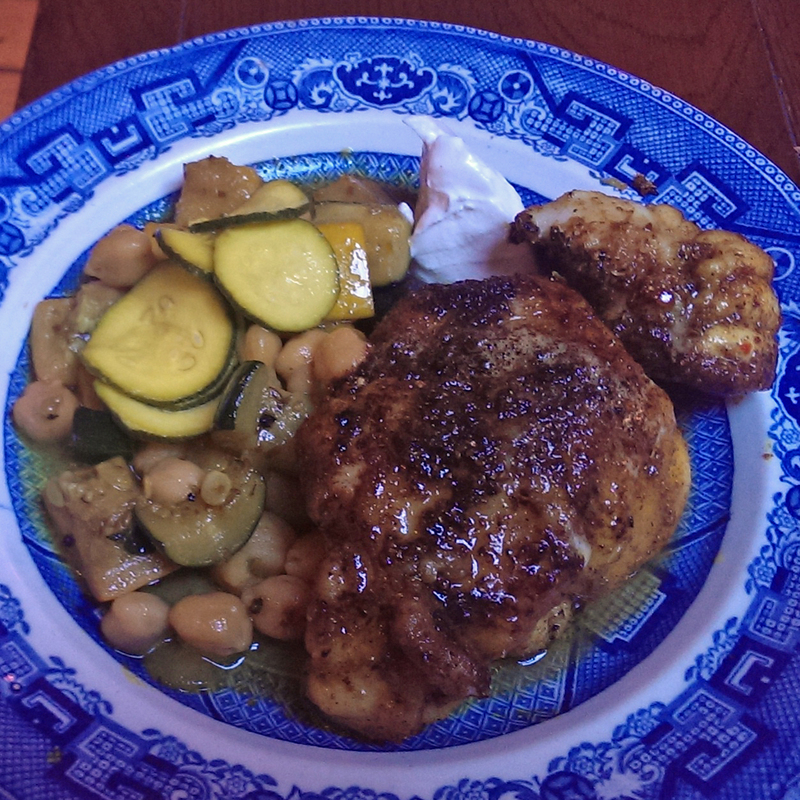 The monkfish was really delicious and was spicy but not overwhelmingly hot. The quail was also up to the same standard. Finally we had enough room for two of us to have watermelon sorbets and the other two to have coffee. The sorbets were pink, not too sweet but strongly flavoured and left a fresh feeling after our very meaty meal. One Italian guest particularly wanted to mention the espresso was good and he certainly doesn’t say that often. With the addition of guest beers, a glass of wine and the service , the bill came to £106.36 which for the quality (and quantity) of the food we thought was really good value.